I recently discovered the amway skincare products (see here) and now I had the chance of testing their haircare products at their event in Brussels. I was treated to pampering session at the hairdresser who used their new Satinique haircare range. I also discovered their new beauty products (including their lipsticks , which I'm a big fan of) . We all know that coloring your hair makes isn't good, that's why I try to take good care of my hair by using oils , masks and conditioners. Not only do I look for nourishing products, they also have to smell good. 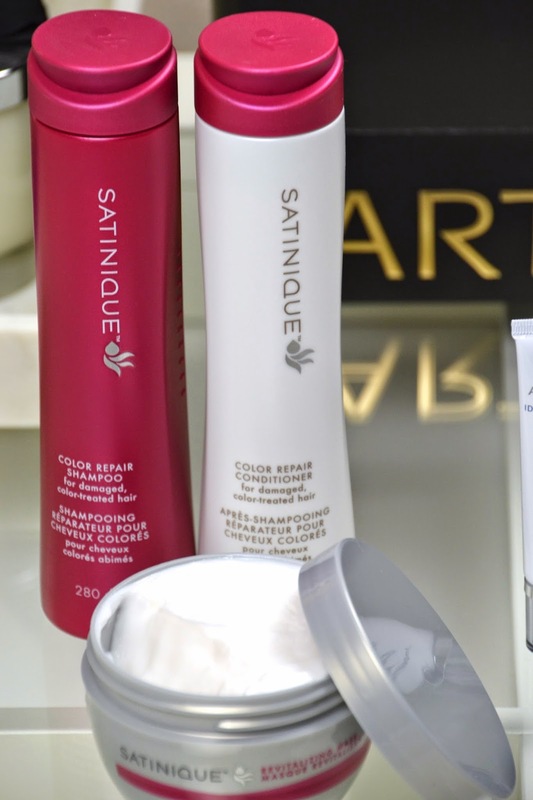 I first tried the Amway Satinique products a few weeks ago and I've noticed that I need less hair oils while brushing my hair after using the Satinique Color repair range. After my recent holiday my hair was really damaged from all the sun, so it needed some extra attention. I used the revitalizing mask and I've put a decent amount of the product all over my hair, wrapped it in foil and slept with it. The next day I washed it out using the color repair shampoo and used the color repair conditioner on the lengths of the hair. OMG , the results were amazing! My hair felt nourished and shined like crazy :-). I now use the Color repair haircare range once a week (and leave in the mask overnight) and I love it ! What a invention! thanks for shearing the experience. ben ze ook aan het testen. Zalige producten.